We're planning a special night just for you with our friends at the Chicago Red Stars. Come join us as we cheer on the Red Stars on May 26th at Toyota Park! When you purchase, you'll receive your very own referral link to share with your friends and family. Anyone that buys from your link will automatically be seated with you. For every ticket purchased, $5.00 will be donated to Indivisible Aurora to support Aurora's Inaugural Pride Parade. To pre-purchase parking passes and save time on game day please call 773-698-6804. If you have any questions please contact Abbi Williamson at awilliamson@chicagoredstars.com or 773-698-6804. Join the Chicago Sky for their annual Pride Night on June 1st! Enter 'AURORAILPRIDE' when searching for ticket, by clicking here! 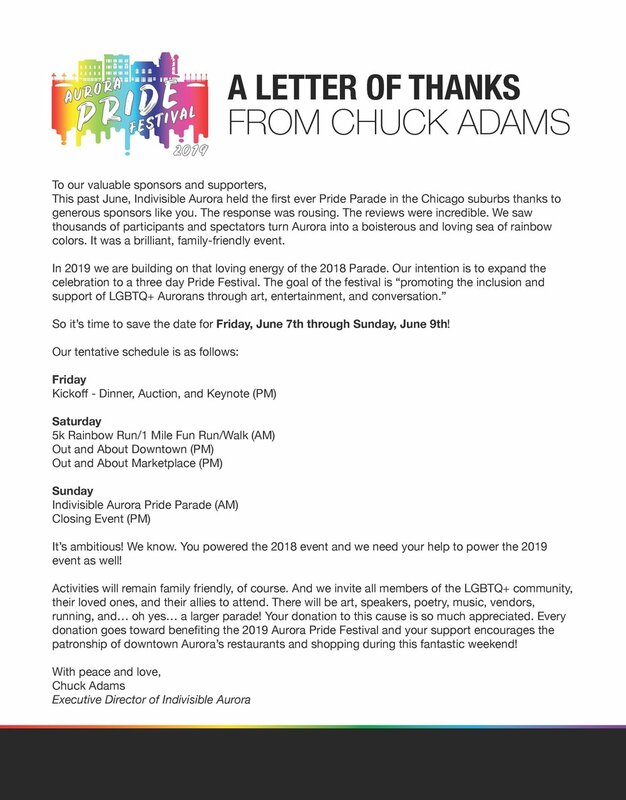 All ticket sales through this link will include a donation to support the Aurora Pride Parade! For questions, contact Jordan at 312-994-5963 or jmendelson@chicagosky.net. Thank you to our wonderful friends at The Yetee for our wonderful Aurora Pride Parade 2018 t-shirts! If you are interested in getting an Aurora Pride shirt, we will be selling them at the Pride Parade for $15. Want a shirt before the Parade? Visit our table at First Fridays in Downtown Aurora on Friday, May 4th and Friday, June 1st! In addition, The Yetee generously donated t-shirts to all of our volunteers who will be helping out on the day of Aurora's Inaugural Pride Parade! A huge thank you to The Yetee team!